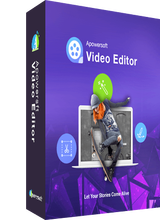 ApowerEdit 1.2.4 was available as a giveaway on November 16, 2018! On behalf of Apowersoft Customer Service Team, I would like to express our sincere gratitude to you for your support of ApowerEdit. In order to help you use this program better, please let me share you some tips below. If you have any questions or feedbacks regarding today’s giveaway, please do not hesitate to contact us. 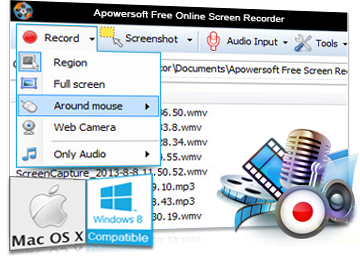 You can either send feedback along with log file from the program by clicking “Help” > “Feedback” at the upper left corner, or send email to us at support@apowersoft.com. We will help you solve them as soon as possible. Hope you will enjoy using our program! Apowersoft, VIP is not activated! Please re-send us an activation code! Thanks! Couldn't even download this. Download link was dead. Rather disappointed to see neither shake reduction nor correction of lens distortion. Both are necessary when working with video files created with most "sports" cameras. I got it installed and working. But I can't recall such a crazy, complicated registration system as this one. 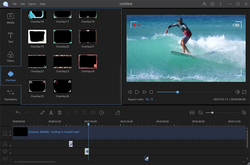 Installed and tried out, it is VERY VERY basic editor, too dark to be usable, there are better, much better freeware out there which can do much more than this can, and 80 bucks for this? Must be kidding. Not worth it, uninstalled. Feasach, pretty sure its a video editor and a jpg is an image, not a video. It could be the reason. 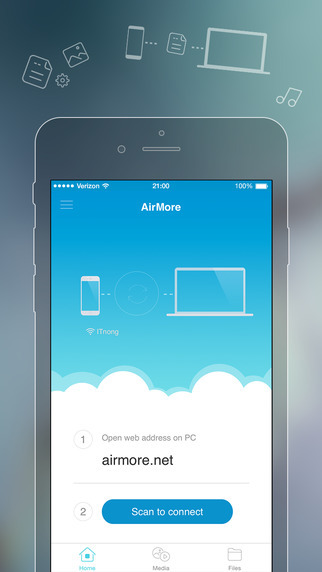 Just curious about this download. I downloaded this version back in May. This is the same version as then. Maybe a newer build. Mine expires May of 2019. Whats new for this give away??? So what happens after the year is up? Does it stop working or just revert to a lesser version? I received the e-mail from apowersoft,but didn't receive any registration code. I received the e-mail from apowersoft,but didn't receive any registration code. What's wrong? .....and now for real world testing results. Downloading was OK but installation was lengthy in my test. Registering with the VIP account was OK, but launching the program took a long time on the first go. Launching later was OK. You must log-in on the first-time launch. Later launches were fine. Importing media was OK. It takes a bit to understand how to manipulate items on the timeline, but it does work well overall. I was able to work with a title, transitions, make audio enhancements, and finally export to video. I do feel it is rather expensive for only a year's rental however. Overall, not a bad program, but a little pricey. The fact that you don't have a ton of options may work better for some who don't want to be overwhelmed with too many features. Results may vary. No problem to get the key nor to install on my 7-64SP1. It got it's merits as a basic editor . I was able to use it a bit offline so I guess one not need to be online just to work it. Text can be type RTL and that is a big plus!! I'll keep it for a while. No problem to get the key nor to install on my 7-64SP1. It got it's merits as a basic editor . I was able to use it a bit offline so I guess one not need to be online just to work it. Text can be type RTL and that is a big plus!! I was looking for the languages files to see if I can translate the menus, but I couldn't find them One minus is no export with WMV3 only with WMV2 I'll keep it for a while. I have been enjoying the use of programs offered by GAOTD and their partners for years. I evaluate them and if they are useful I purchase the full version. This is a GREAT system and service. THANK YOU vendors and GAOTD! I tried the program; was easy to install. The interface is not intuitive, the menues seem childish; and for something that looks so simple it hard to figure out. i tried the tutuorials ans they rced through and no categorical step by step instruction. I took note of adding saturation and color and other simple edit features. I could imgine some far more rich and inventive and a panel more organized into categories. From what i see i need to train myself, and figuring it out is cumbersome; i guess its a programmers main challenge to solve an make software intuitive. How does it work? Instructions that exist are lousy. By the way, enter the program via editing mode? very annoying! You should come in on one screen. I thought this might work more like music editing software, you highlight an area, adjust it save and play.again, i could organize it much better. I tried the program; was easy to install. The interface is not intuitive, the menues seem childish; and for something that looks so simple it hard to figure out. i tried the tutuorials ans they rced through and no categorical step by step instruction. I took note of adding saturation and color and other simple edit features. I could imgine some far more rich and inventive and a panel more organized into categories. From what i see i need to train myself, and figuring it out is cumbersome; i guess its a programmers main challenge to solve an make software intuitive. How does it work? Instructions that exist are lousy. By the way, enter the program via editing mode? very annoying! You should come in on one screen. I thought this might work more like music editing software, you highlight an area, adjust it save and play.again, i could organize it much better. george james ducas, The online help is not very helpful. Very confusing. 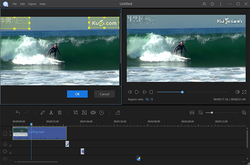 I'll stick with VSDC Free Video editor or the Pro edition which has been given away here in the past which while more complex in operation it is 4K video capable even in free edition and includes many advanced timeline operations and multiple video and effect tracks and sprites onto which the tracks video is rendered and can be transformed by many effects. 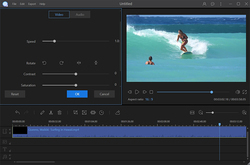 Very basic video editor. It's good if that's all you need. But $79.95, seriously??? I enjoy a good parable and the use of metaphors. For me the point is that for years, Giveaway of the day only offered free products. They were often limited versions however they never expired. Unfortunately, the name of the site should be changed to TryMe for a while or GetAGood Program of the quarter (of a year). I still check every day and appreciate the attempt to be a valuable resource. It just isn't "as" valuable any more. Tried to see how it would work, I took several *.avi files from my DVR security system and added them, found the GUI (interface) easy to understand, dragged the files in the order I wished to show towards the bottom, I was able to save project, export the movieish file ( gave options to export (save as ) as mp4, avi, wmv, mkv, mov, to be played on android or apple devices ) original avi size for 2 files was 128mb took about 5 min to change to a mp4 at 42.2 MB, quality seems good, unfortunately my DVR does not have sound recording connected at this time, and I did not add any audio, but I expect it would be easy to do and would have worked as well. 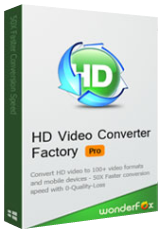 Great Product, if I needed a program to make my own custom videos, I would really consider purchasing this one. Unzip the package you`ve downloaded and install the software by running Setup.exe. or create a new one. Restart the program to update your account info (1-year account). Note： Please activate the ApowerEdit before November 16th, 2018, otherwise your VIP account will expire. I'm not quite as interested in how much of a "gift" this is. 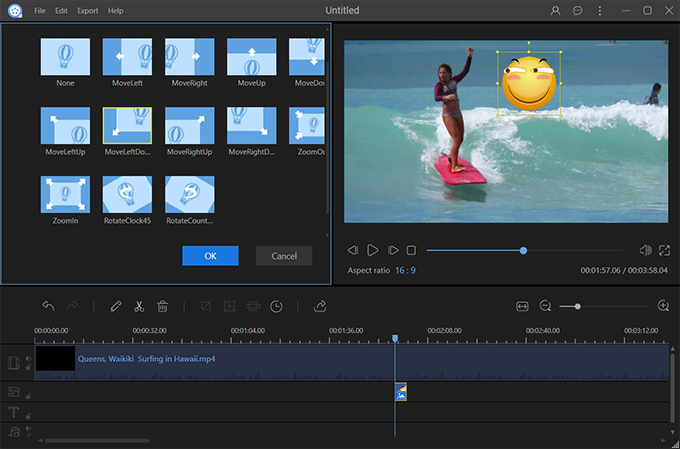 Rather more practically, if a video is edited in this program during the year, can it be exported in standard video formats that can be used in anything or subsequently edited in another program if one chooses not to buy this one? marc, what not clear? you backed a cake and after a year the oven brock ... what happened to the cake? Thanks afik, should I infer from this metaphor that you are familiar with this oven and that the cake that it bakes can then be sliced and served with any knife? 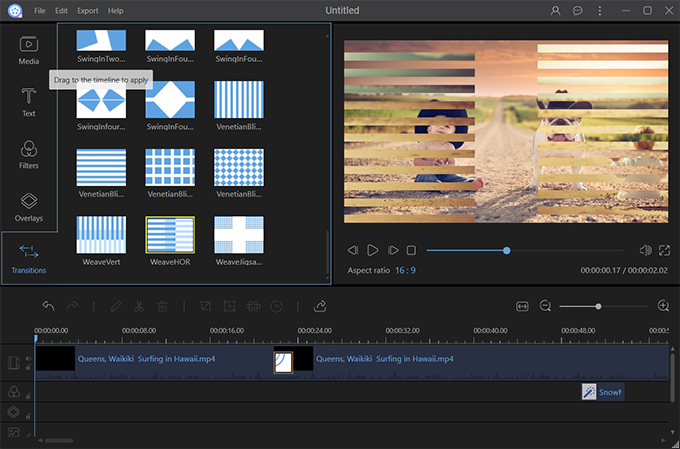 To step out of the metaphor and be more concrete, is the output or exports of this product editable afterward by other video-editing software? Thanks afik, should I infer from this metaphor that you are familiar with this oven and that the cake that it bakes can then be sliced and served with any knife? 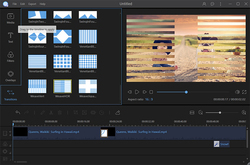 To step out of the metaphor and be more concrete, is the output or exports of this product editable afterward by other video-editing software? Marc Goldberg, Once you edit your videos from the raw materials your output is a new video, a new file . That one is free as a bird and you can do what ever you want. Even slice it with scissors. afik, as far as your understanding of Marc's question goes, you are correct. If he exports his edited file as a .mp4, .mpeg, .avi, etc, he can do what he wants with it. But I don't think that is what he was getting at. Not all editing is done in one session. 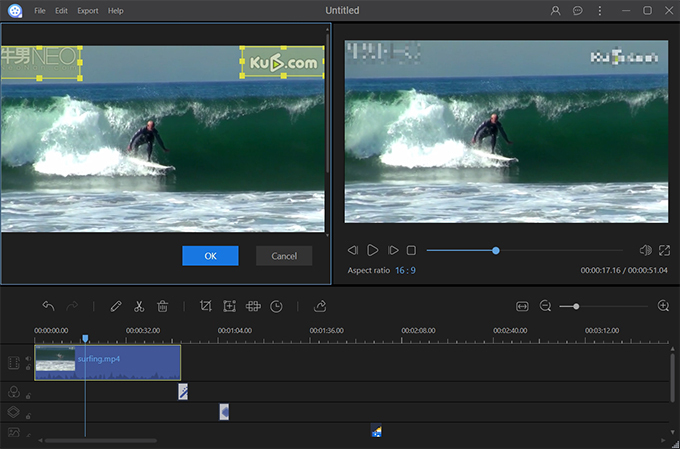 As you edit a video, the editing program makes notes of what source files you are using, where you cut in and out of them, your transitions, text, and other effects, volume levels, etc. That allows you to come back and continue where you were before without having to leave the program open. It also allows you to come back and re-edit a piece at any time later, even if it has been finished and a finial product rendered. 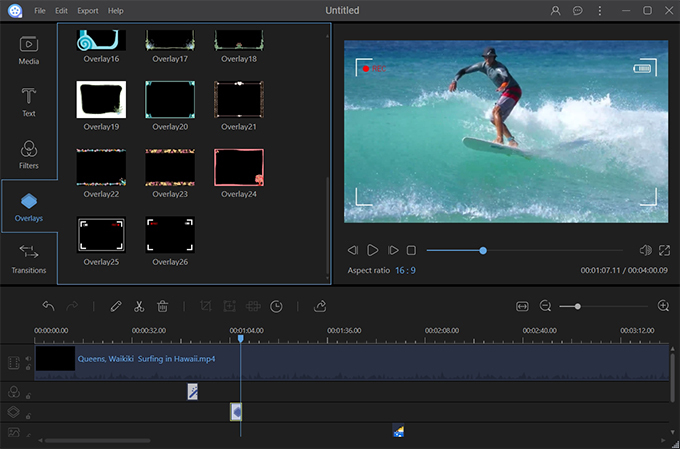 Say you make a video, then a week, month, or 5 years later, decide to add or remove material, change volume levels, and so on, without having to recreate your entire edit. 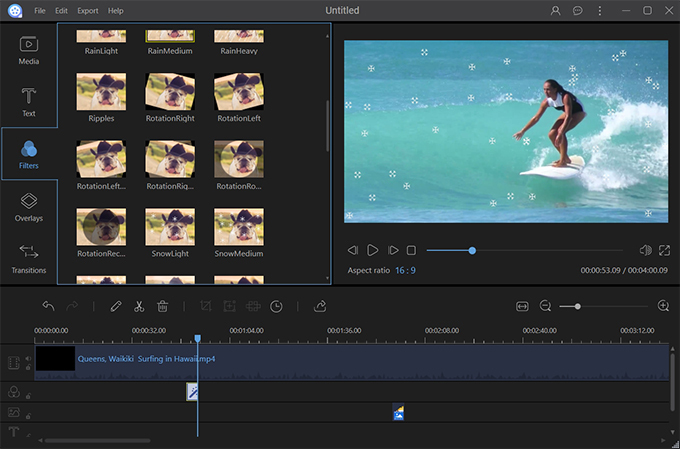 I understand Marc's question to be if APowerEdit can save the project files in a format which would allow them to be opened in another editing program after the 1-year license has run out. I didn't get this offer, and don't know what the APowerEdit project files are, much less if it can save in someone else's format, or if any other editing programs can open the APowerEdit files. I leave that to anyone else to fill in. afik, as far as your understanding of Marc's question goes, you are correct. If he exports his edited file as a .mp4, .mpeg, .avi, etc, he can do what he wants with it. But I don't think that is what he was getting at. Not all editing is done in one session. As you edit a video, the editing program makes notes of what source files you are using, where you cut in and out of them, your transitions, text, and other effects, volume levels, etc. That allows you to come back and continue where you were before without having to leave the program open. It also allows you to come back and re-edit a piece at any time later, even if it has been finished and a finial product rendered. Say you make a video, then a week, month, or 5 years later, decide to add or remove material, change volume levels, and so on, without having to recreate your entire edit. The files that allow you to do that are the roadmap of your edit. Different programs use their own proprietary formats to do this. For instance, VSDC saves this info in a video project file > .vproj Movavi Video Editor project files are .mepx I understand Marc's question to be if APowerEdit can save the project files in a format which would allow them to be opened in another editing program after the 1-year license has run out. I didn't get this offer, and don't know what the APowerEdit project files are, much less if it can save in someone else's format, or if any other editing programs can open the APowerEdit files. I leave that to anyone else to fill in. Downloaded and installed on Win 10, registered on a page that says VIP account "Free Updates" for a year. The program opens with a splash screen announcing that a new version is available (V 1.3.2) that has bug and crash fixes. "Do I want to update?" So, why not just offer the new and fixed version? If I update, is it still free? Downloaded and installed on Win 10, registered on a page that says VIP account "Free Updates" for a year. The program opens with a splash screen announcing that a new version is available (V 1.3.2) that has bug and crash fixes. "Do I want to update?" So, why not just offer the new and fixed version? If I update, is it still free? Good selection of text effects, transitions, etc. Had a little play - seems very simple to use. Installed and registered fine on Windows 8.1 Good selection of text effects, transitions, etc. Had a little play - seems very simple to use. Should be useful. Tried twice now to launch it but it just freezes at start screen even though I uninstalled it and reinstalled it. Doesn't work, says unknown error occurred when trying to sign in. Uninstalled: confusing and simplistic interface. Don't bother a $79.95 cost. Really??? Downloaded , installed registered all within minutes :) , tried a few video's , effects not too shabby. Before download i have Just 1 question. After 1 year what will happen? i'm going to give this ApowerEdit 1.2.4 a try .. .
one year from now . Boss .. i'm going to give this ApowerEdit 1.2.4 a try .. . i'll let you know .. one year from now . Boss, after 1 year your CPU will burn. What happens to your TV one week after warranty? Boss, after 1 year your CPU will burn. What happens to your TV one week after warranty? Good, but after 1 year program won't work unless we pay. This is NOT really a Giveaway. This is a sort of extended trial. Finally we have to pay if we want it. And Giveaways are not made for paying for them after a while. Good, but after 1 year program won't work unless we pay. This is NOT really a Giveaway. This is a sort of extended trial. Finally we have to pay if we want it. And Giveaways are not made for paying for them after a while. Marauder, If you borrow a book from the library and do not return it, after a while you have to pay for it. A free loan. But if you are given a book you do not have to pay. A free gift. The difference. Marauder, If you borrow a book from the library and do not return it, after a while you have to pay for it. A free loan. But if you are given a book you do not have to pay. A free gift. The difference. Zen , In this context, this makes no sense whatsoever. In one year, this program will not work. So you are saying it is still a gift? In your (poor) analogy, this is like being given a book you do not have to pay for, but in the middle of the night, the person takes the book and cuts all the pages up. You can still keep the book, but its useless. Is it still a good gift? Marauder, nothing in this life is free - when you grow up you'll realise that. The software companies providing you with extended trials are in business so that they can put roofs over their heads and feed their families. 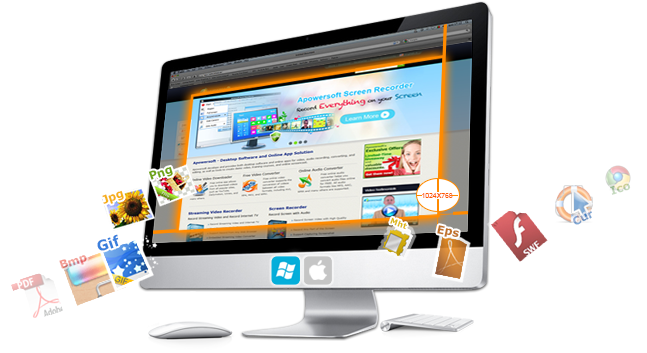 If, after a very generous one year of using their software at no cost you find that you really like it, then pay for it! Marauder, we got this version on May 20 this year. An earlier version on June 16 last year. So we get a new giveaway within a year. In that case I do not complain with a licence period of one year only. Chris, You misunderstood me. It is NOT a gift, I gave an example to support Marauder, not to contradict him, but apologise as I see I did not make it clear. Chris, I expressed myself badly, it is NOT a gift, I supported Marauder. TeeGee, lots of things are free all the freeware utilites on various freeware developers sites are entirely free, MOST opensource projects on the various open source developer platforms are entirely free to use and permit modification of the programs too with certain cost free restrictions or conditions. 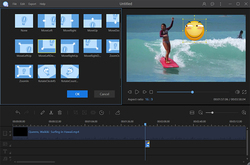 While you are on the surface of planet earth in this life the air you breath is free...Video editing software does not need constant use of the developers resources so should not require a rental fee. Only additional payment should be for optional updates/upgrades not for continued basic functionality of the purchassed or giveawayoftheday license.